Gingerbread, Pronouns, and a Freebie: OH MY! We have been doing our best to stay focused in Room 3 in the last week or so, but I have a feeling this week is going to be a *bit* harder. We started teaching pronouns shortly after we came back from Thanksgiving and my kids were struggling a bit when it came to choosing the correct pronoun for a given sentence. This is pretty typical for my ELL learners, but it did mean that I needed to find some new resources so that we could work in some extra practice. Oh Pronoun Tree, Oh Pronoun Tree! This was definitely a class favorite. Both classes LOVED making a Christmas tree and I loved being able to differentiate which pronouns my students were using. I used my tee-tiny post it notes to hand out pronouns. This kept us from copying our neighbor's word or repeating the same pronoun over and over. It also let me challenge a couple of my kids with pronouns like myself and yourself. My kids are also going NUTS over a song I found on Pinterest from Mrs. Braun's 2nd Grade Class! I charted it out but they have been begging for a copy to keep in their Skills (Grammar) Notebook, so I thought I would share it with you all as well! Click the picture to grab your own copy! It's sung to the tune of "Spongebob Squarepants" and we have loved ending our morning meeting with a song for the day! :) Just click on the picture to grab it from Dropbox! One "twist" my kids have especially enjoyed is to have the boys and girls take turns singing the bold and plain sections. 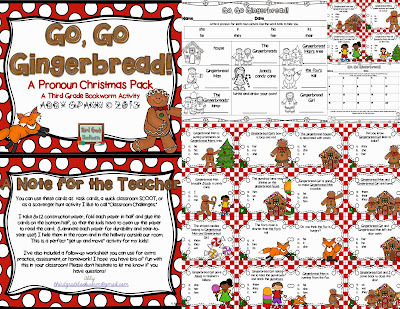 I also started using the revamped resources from my Gingerbread Goodies unit! This is the first time in several years I've been able to use seasonal resources and I am SO excited! The kids have been pretty pumped too.We've been reviewing character traits and while I was at "teacher school" on Thursday, I had the sub read The Gingerbread Girl by Lisa Campbell. They loved it! I just found out there is also a sequel - The Gingerbread Girl Goes Animal Crackers (HA!) and it's on its way to our class via Amazon! You can check them out by clicking on the pictures below (affiliate links). After they read the book, I asked them to write about one of the main characters in the story. We've had several lessons and discussions on how to write about the characters in our books, but I was pretty proud of the work they did! I'm also printing off these games to use this week. I'm pulling one of them out on Wednesday for my observation, but I wanted to share it with you guys today! This pack has 2 different classroom activities - one for the whole class and one for small groups or partners. Whole group: There are 20 different task cards that I like to hang up around the room for the kids to find and answer. They are practicing the skill I need them to work on, but they are moving and getting some of the Candy Cane Crazies out at the same time! I've also included a recording sheet and an extra practice page that you can use for homework, classwork, or even as an easy sub activity! Make sure you are following my December Pinterest Board! There are LOTS of freebie pins and I'll be pulling ideas from there all week. I have monthly Pinterest boards for the entire school year, so if you want to get a head start on the rest of the year give those a follow as well!